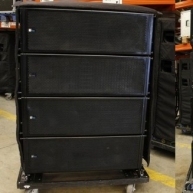 Buy used & second hand Meyer Sound sound systems, line arrays and line array elements. 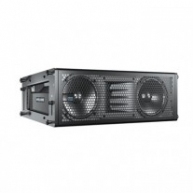 Find complete and partial line arrays and larger quantities of line array elements and subwoofers. 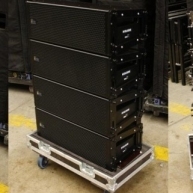 Browse of catalog of ex-hire Meyer Sound line arrays, sound systems and line array elements for use in small theaters, festivals and full size stadium venues. 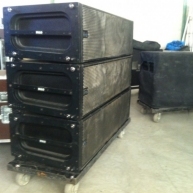 Our pre-owned line arrays typically had previous use in production rentals, corporate rentals or installation applications. Package of (20) Melodie and (6) 700HP in excellent condition. Turn Key Melodie System with (24) Melodies and (6) 700-HP in great condition. Previously used in rentals. Package of (20) MICA and (10) 700 HP in good condition. Turn key MICA System in good condition. Previously used in rentals. 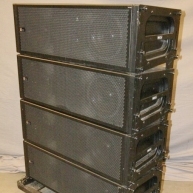 MILO 90 turn key system with 1100 Subs in great condition, previously used on rentals.